The Regulator Movement, also known as the War of the Regulation, involved the violent actions of discontented North Carolinians from several western counties who were fighting what they viewed as corrupt and unfair practices of the colonial government. 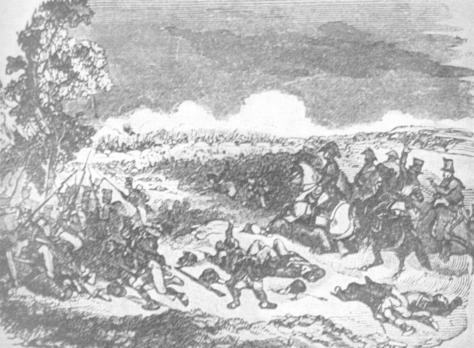 The uprising culminated in a battle three miles south of the town of Alamance in present-day Alamance County. In January 1771, responding to Regulator violence, the Assembly passed Johnston's Riot Act, which, among other stipulations, empowered royal governor William Tryon to call out the militia to maintain order and enforce the law. In March 1771 judges of the superior court at Hillsborough informed Tryon that they would be unable to hold court without protection from the provincial militia. In response, Tryon called out the militia to undertake an expedition against the Regulators. Encouraged by a bounty of 40 shillings, the militiamen assembled at New Bern and on 22 April began marching toward Hillsborough. Other militia companies joined Tryon's force, and by 3 May, when the troops reached Smith's Ferry on the Neuse River in Johnston County, the army had grown to 1,068 men. Gen. Hugh Waddell commanded a second detachment that proceeded from Cape Fear to Salisbury, where he planned to enlist western militia, suppress Regulators in the Yadkin River Valley, and then join Tryon at Hillsborough. Unable to recruit men in the west, Waddell left Salisbury on 9 May and advanced toward Hillsborough. At the Yadkin River his army of approximately 300 men was met by a larger number of Regulators, who forced his troops to return to Salisbury. On 11 May Tryon and his force left Hillsborough for Salisbury on a route through the heart of Regulator country. Three days later, they encamped on Alamance Creek. Meanwhile, three miles west of their position approximately 2,000 Regulators gathered on the plantation of Michael Holt. On 16 May 1771, after several failed attempts at communication to avoid bloodshed, Tryon directed the militiamen to move toward the Regulator encampment. As his force approached the Regulators, Tryon sent a proclamation ordering the insurgents to disperse within the hour. Tryon's men, numbering approximately 1,000, advanced to an open clearing where their front lines were almost touching the front lines of the Regulators. Slowly these Regulators withdrew into a wooded area to join their main force, thereby leaving the provincial army in the clearing and within 25 yards of a Regulator line that had formed at the edge of the woods. After a final warning by Tryon and continued Regulator defiance, the battle began. Some contemporary accounts state that when Tryon gave the order to fire, the militia hesitated. The governor repeated his command, shouting "Fire, fire on them or on me!" and the troops turned their weapons on the insurgents. Though greater in number, the Regulators, who did not have a true commander or sufficient ammunition for a lengthy engagement, were no match for Tryon's militia and artillery, which included two field pieces and four swivel guns. The Regulators' initial fire forced the provincial army to fall back. Some Regulators rushed forward and seized one of the cannons, but without ammunition or skill in firing it they were soon driven from their position by Tryon's force. Grapeshot from the two cannons was instrumental in dispersing the Regulators. In his report to Lord Hillsborough, secretary of state for the American colonies, Tryon wrote that after about half an hour the Regulators "took to tree fighting" and that he then advanced his first line to force the Regulators from their cover and pursued them "a mile beyond their camp." Tryon reported 9 militiamen killed and 61 wounded. Regulator casualties were more numerous: estimates range from 9 killed and an undetermined number wounded to as high as 300 killed and wounded. Tryon took 15 prisoners, one of whom was hanged on the battlefield that evening. In trials at Hillsborough, 12 Regulators were found guilty of treason; 6 of these were executed and the others pardoned. On the day following the battle, Tryon offered to pardon all Regulators who would swear allegiance to the Crown. Within six weeks, more than 6,000 backcountry settlers had taken the oath and received pardons from the new royal governor, Josiah Martin. William S. Powell, The War of the Regulation and the Battle of Alamance, May 16, 1771 (1965). Powell, James K. Huhta, and Thomas J. Farnham, eds., The Regulators in North Carolina: A Documentary History, 1759-1776 (1971). "The Battle of Alamance," from the Neglected History of North Carolina by W.E. Fitch, 1905 (pp. 206-232). Image courtesy of Texas A&M faculty, Wallace L. McKeehan. Available from http://www.tamu.edu/faculty/ccbn/dewitt/mckstmerreg4.htm (accessed June 4, 2012). My 6th great grandfather, Peter Craven, fought in the Battle of Alamance in the Battle of Hillsborough as a REGULATOR. I am getting conflicting information on whether or not he was one of the 6 Regulators who were hanged. I thought this was almost as good as bacon. I didn't really get the information I need.